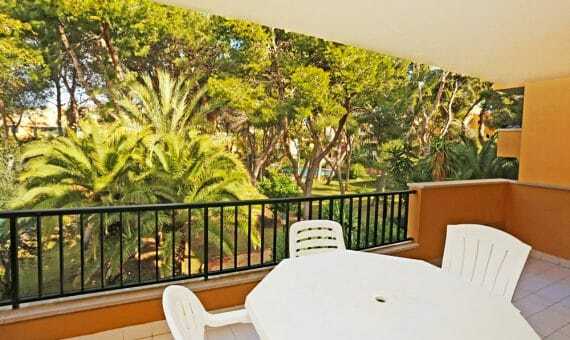 Marvellous penthouse apartment in walking distance from the beach in Santa Ponsa, a famous resort on the southwest coast of Mallorca. The exclusive property of 100 sqm of living area was recently fully refurbished with the highest quality materials and leaves nothing to be desired: airy light flooded rooms, smart distribution, high tech appliances, modern elegant design, stylish furniture and decorations, – everything is created with the aim to provide the highest level of comfort. The apartment is composed by spacious living room with dining area, a big kitchen, 2 double bedrooms, 2 bathrooms, laundry and a dressing room. The highlight of the penthouse is its huge terrace, located on the same level with the apartment, which is partially covered, and is equipped with lounge areas, one of them serves as a summer cinema, dining areas, barbeque, plenty of space of sunbathing, and can still be equipped with extras as Jacuzzi, summer bar/kitchen, etc. The location on the last floor guarantees the absence of the street noise, but at the same time you have everything necessary in 2 steps from the building: shops, restaurants, cafes, banks, pharmacies, etc.